The search is on for construction methods which are light in energy consumption as well as in the use of materials. Help might come from the fungus farming termites’ ingenious mound structures. As the world’s climate changes, its growing human population faces new challenges. The search is on for construction methods which are light in energy consumption as well as in the use of materials. However, these new methods must also prove sustainable. Help might come from where it is least expected: the fungus farming termites. To gain an understanding of these termites’ ingenious mound structures, researchers used the Mimics Innovation Suite to try to understand their innovative construction method. The mounds of the African termite, Macrotermes michaelseni, which are common through sub-Saharan Africa, may hold the key for a major breakthrough in ecological architecture. Many entomologists, physiologists and engineers agree that this construction is one of the most fascinating and ingenious ventilation structures in nature. The termite colony, which resides in a subterranean nest, builds these mounds from the surrounding soil. The mound powers ventilation of the subterranean nest by capturing the wind’s energy. The mounds are organs of colony physiology, in the broadest sense, shaped to accommodate and regulate the exchange of respiratory gases between the nest and the atmosphere. Fascinated by this natural ventilation system, a group of researchers became convinced it could be applied to human habitation. But in order to make that possible, they first needed a closer look at the complex architecture of these mounds. Understanding the thermoregulation of the termite mound required knowledge of how its complex architecture integrates structure and function. Once its 3D geometry had been captured, the entire interior structure could be analyzed. Mimics proved to be a great tool for this. As the mound is best investigated on-site in Africa, the researchers opted for a digital slice-and-scan technique to capture the geometry of the termite mounds. Consequently, the team at Loughborough University built the world’s largest custom-built, slice-and scan machine and shipped it to Namibia. To maintain the mound’s structural integrity, the researchers first infiltrated the structure with plaster of Paris. The plaster also improved the contrast between the mound material and its internal voids. The slice-and-scan machine operated continuously day and night over a two- month period. Since the 2D scan could not be performed in a constantly illuminated environment, different lighting levels occurred throughout the images as the sun passed overhead. This made it impossible for the researchers to use a single threshold value to translate the scanner images into a 3D reconstruction. However, thanks to Mimics’ powerful threshold editing tool, they easily overcame this obstacle. The tool allowed them to add unselected areas to the applied mask. Because of the vast amounts of image data, the mound was reconstructed in Mimics in separate segments, converted to STL format and subsequently assembled in Materialise’s Magics software. In Magics, the team then recreated the complete termite mound digitally by concatenating and aligning the segments. The researchers used the 3D model to gain insight into how the ventilation in this mound works. 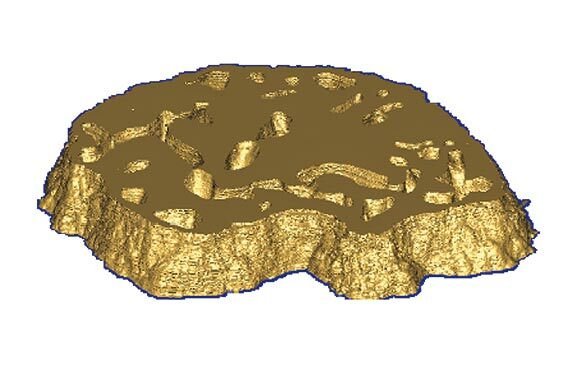 Thanks to the model’s accuracy, they were able to analyze the mound’s internal structure easily, obtaining the dimensions of the various channels and conduits and how they are interconnected. The model’s large size and high level of detail coupled with the current limitations in computational power make computational fluid dynamics (CFD) simulations on the complete mound impossible. As a consequence, the researchers generated a simplified model, based on in-depth analysis of the reconstructed 3D model to carry out CFD analysis on the whole mound. 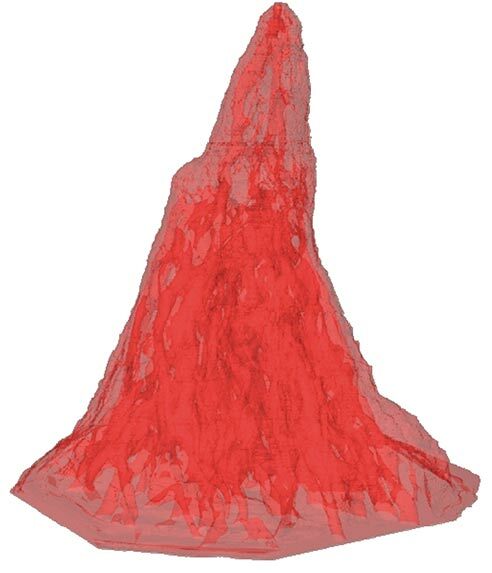 Thanks to Mimics’ powerful and user-friendly 3D modeling capabilities, the researchers were able to reconstruct a complete termite mound. They have gained a clear insight in the internal structure of the termite mound and the way all the internal voids are interconnected. Future CFD analyses will unravel the natural ventilation system in these mounds. As the accuracy of the underlying 3D computer model is crucial in these analyses, the Mimics Innovation Suite proved to be a great tool for the processing and editing of the scanner images. Wind flow through a section of mound skin with egress channel showing the variable impedance generated by the presence of these channels. This project, called the TERMES project (www.sandkings.co.uk), is a collaboration between entomologists, physiologists, mecha- nical and civil engineers from Loughborough University’s Department of Mechanical, Manufacturing and Civil Engineering; SUNY (State University of New York) - Syracuse, College of Environmental Sciences and Forestry; The National Museum of Namibia; and Cambridge University’s Department of Zoology. The project has been supported and assisted by Saint-Gobain, BPB Gypsum, Materialise, Helm X, RS Components, Binfiglioli UK and the government of Namibia. The Mimics Innovation Suite turns 3D image data into high quality digital models in an accurate and efficient way. Starting from CT, MRI or 3D ultrasound images, the Mimics Innovation Suite offers the most advanced image segmentation, the broadest anatomical measurement options, powerful CAD tools for Engineering on Anatomy and 3D Printing, and accurate model preparation for FEA and CFD.